Read the report and listen to the PRI radio interview. Check out this story from PRI’s The World about the “Diego Rivera and Frida Kahlo in Detroit” exhibition at the Detroit Institute of Arts. Listen to Marco Werman’s interview with the DIA’s Director Graham Beal. This entry was posted in Detroit Institute of Arts and tagged Diego Rivera, Frida Kahlo, Graham Beal, Marco Werman, PRI radio. Read the full Wall Street Journal review. 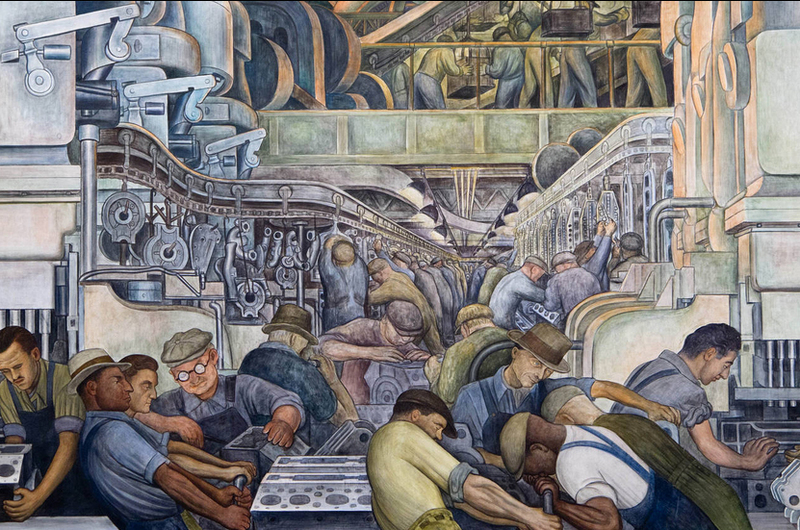 Rivera’s murals in general, and the Detroit ones in particular, mix historical figures with emblematic types, reflecting his concern with macro issues, especially the many injustices suffered by the poor and the dispossessed. Yet, viewed beside his wife’s work, these images all feel somehow impersonal, and can’t match the power of the angst that constantly fuels Kahlo’s art. … it is especially fitting that the final production under the DIA’s retiring director, Graham W.J. Beal, should be a celebration of Detroit, whose treasures he fought so valiantly, and successfully, to save for future generations, while also making this the world’s most visitor-friendly museum. This entry was posted in Detroit Arts and tagged Diego Rivera, Frida Kahlo, Wall Street Journal. Read the full NY Times review. … The Rivera-Kahlo exhibition revisits the creation of a masterpiece made in Detroit, for Detroit, that would have been hard to sell because it is an intrinsic part of the Detroit Institute’s building. “Detroit Industry” is an idealized ode to the city in 27 frescoes. These formed the project that brought Diego Rivera, best known of the Mexican muralists, to Detroit in April 1932, accompanied by his much younger wife, Frida Kahlo, also an artist. Over the next 11 months, Rivera researched, designed and painted the frescoes that cover the four vaulting walls of the museum’s courtyard, now known as the Rivera Court. It features heroic scenes of muscular workers and even more idealized earth mothers grasping sheaths of wheat or armloads of fruit. All told, the “Detroit Industry” frescoes are probably as close as this country gets to the ceiling of the Sistine Chapel. This entry was posted in Detroit events, Detroit Institute of Arts and tagged Detroit Institute of Arts, Diego Rivera, Frida Kahlo. Read the full article on the Detroit Historical Society’s blog. Detroiters, visitors and art lovers from around the world adore Diego Rivera’s frescoes at the Detroit Institute of Arts (DIA); Rivera Court is a treasure by any standard. Rivera created this masterpiece in 1932-33, so you’d have to be around 90 years of age today to remember how the court looked before he arrived. … But Diego Rivera and Frida Kahlo weren’t the only artists in town during the 1930s. Detroit has long been a hotbed of creativity, and artists of all kinds continue to flock here. The Detroit Historical Society is currently showcasing several artists from the 1930s in its exhibit “Detroiters Paint Detroit: 1930s,” a collection of urban landscapes, open now through October 2015. For info on “Detroiters Paint Detroit” visit http://bit.ly/1NkCdAE. This entry was posted in Detroit History, Post Cards and tagged Detroit Institute of Arts, Diego Rivera, Frida Kahlo. Read/listen to the full NPR report. 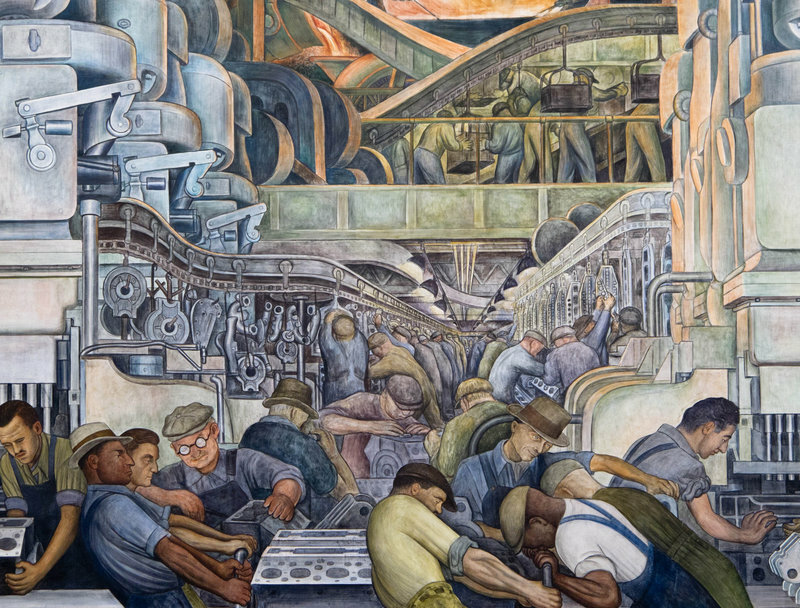 The exhibit, “Diego Rivera and Frida Kahlo in Detroit,”has special significance to the city — at its heart are Rivera’s Detroit Industry murals, painted on the walls of the DIA. Grand in scope and scale, they celebrate Detroit’s auto factories, and depict a kind of worker’s utopia — men of all races side by side on an assembly line. Commissioned by Henry Ford’s son Edsel, the murals offer incredible detail. One engineer at the time said the artist coherently fit 2 miles of assembly line onto two walls. But the grand murals stand in stark contrast to Kahlo’s paintings, which are small and intensely personal. 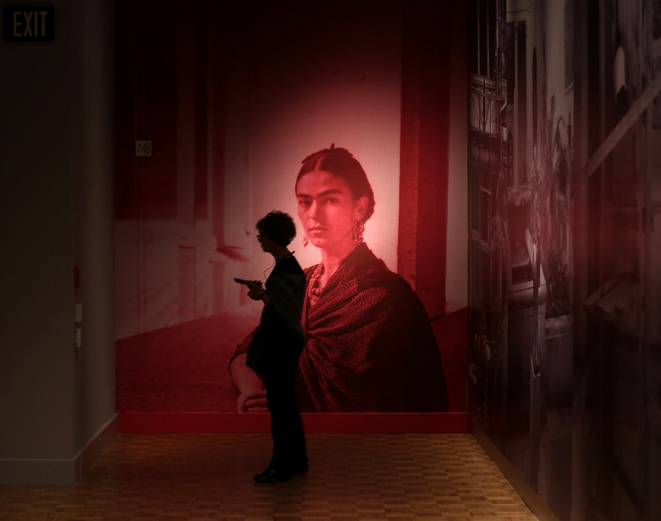 As the museum says in the exhibit description, Rivera romanticized Detroit; Kahlo rejected it. Museum director Graham Beal tells NPR’s Don Gonyea that the exhibit has taken on a deeper meaning for the museum and for the city as a whole. 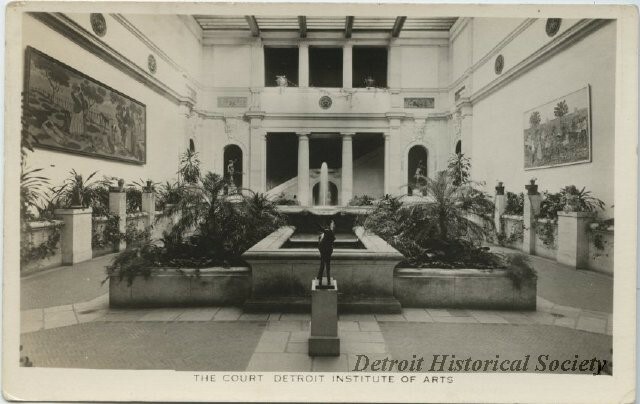 This entry was posted in Detroit History, Midtown Detroit, Museums and tagged Detroit Institute of Arts, Diego Rivera, Frida Kahlo, Graham Beal.